I didn’t grow up in a nuclear family setting. I, quite honestly, wasn’t even born to two parents. I was born into a podunk Colorado family with a young mother, a younger uncle, two grandparents, and a dog named Muffin, who hated me. You might notice that my home didn’t include a biological father. It never did. That’s another megillah for another time, because this story is about the person that raised me to be who I am today. I didn’t ask for all of the love and support that I got throughout my childhood and to this day, and quite frankly, I don't think I deserved it. My grandfather, formally known as Rich, is the reason my family exists today. Since I could talk, I referred to him as “My Reech.” Yes, he was—and is—my Rich. My little sister named him “Papa” when she came around seven years later, because she couldn’t pronounce grandpa. Papa stuck, and that’s his title now to anyone who is lucky enough to know him. But regardless of what my baby cousins and siblings call him, he’s still my Reech. My Reech—the Kenny Rogers look-alike, the Vietnam veteran, the golf connoisseur—not only paved the way for me, but gave me the opportunity to live fully each day of my life. He continues to teach me daily how to fight for myself, how to take care of myself, and he challenges me to make the best decisions. Each time we talk, which lucky for me is often, he reminds me that he is my advocate in everything. And with that, I can conquer anything. I will always cherish the little things my Reech and I have shared: drives to and from school and camp, Disneyland trips, driving lessons, ribs on the barbecue, “The Bank,” the sizzling sound of the iron every morning, political discussions, Star Wars, childhood and war stories, home videos, Rockies games, Sunday pancakes, my first set of golf clubs, college visits, ski trips, never missing one dance recital or choir performance, going to work with him as a small child where I was allowed unlimited Kix cereal and Sesame Street, every Wednesday when he would bring home the kid-friendly insert from the newspaper for me, the future journalist, and this February, when I proudly brought my Reech to show him off at my sorority’s annual Dads Weekend. These small events are just a few in the amazing, grand bank of memories. There is not a way for anyone to fill the placeholder of a biological father. But that’s perfectly fine with me. I don’t want or need anyone to fill that place in my life. I was blessed with something—with someone—far more special, important, and loving than I could have imagined. Fatherhood is not for the faint of heart, but my Reech has the strongest and biggest heart in this entire world. It might be hard to guess that I wasn’t raised by a biological mother and father, but I hope you wouldn’t assume that. Families are made of more than shared DNA and a common last name. Families cannot be summed up in a dictionary definition. Families are those who support you, challenge you, and love you without condition. Maybe I didn't grow up in a “traditional” family, but I got something far superior. I don’t how my Reech came to be such a loving and supportive person for so many people, but I hope that someday I can be half as wonderful for my family. Father’s Day must be a day to celebrate the fathers who are, who weren’t, who couldn’t be, and who decided to be, because that is what makes up the character, experiences, and hearts of their children. 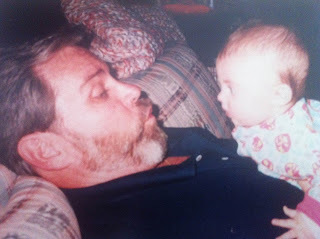 And, Papa, if you’re reading this: Did I tell you I love you today? Jordan is an aspiring journalist, public policy fanatic, and YP4 alumna. Sugar Bear, I am who I am because God brought you into my life! Lovely piece, lovely piece. You are an amazing writer, Jordan! A lovely, lovely piece! You are an amazing writer, Jordan. And you are a blessing to all!